I’ve been sharing what I’ve learned about Chef Compliance, and because it uses the InSpec framework, I want to start a little series on InSpec to gain a fuller understanding, appreciation for, and greater flexibility with Compliance. It’s possible that you’re part of a company, perhaps without a dedicated security team, that uses Chef Compliance from within Chef Automate. And it’s possible that you’re totally content to run scans off of the premade CIS profiles and call it a day. That’s a huge selling point of Compliance. It couldn’t be easier! In reality, however, the built-in Compliance profiles will get you to 80% of what you need, and then you’ll want to add or modify a bunch of other specific tests from the profiles to meet the other 20% of your needs. By the end of this series, I’ll know how to do it (because I’m learning as I go), and you will, too! Today, we’re going to run through a really simple set up and run a Hello World test, just to get our feet wet. And don’t forget, InSpec was written with non-developer-types in mind! That’s actually the thing that attracted me getting started in my tech journey with InSpec and Compliance - because it’s totally approachable and the authors want it to be approachable. By the end of this series, I suppose, I will have tested their intentions one way or another. And for full disclosure, Chef is not paying me for these posts, so you’re getting a truly unbiased opinion. My husband’s company is a customer of Chef’s which is what gave me the idea to delve into Compliance as a starting point. Okay, enough about me, let’s open up some terminals and get started. 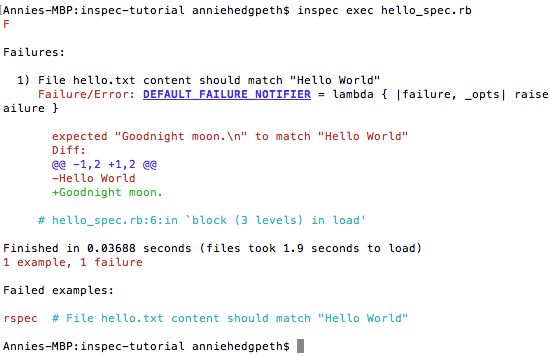 If you already have the updated versions of Homebrew, Ruby, and InSpec, then skip ahead! UPDATE: If you have the current ChefDK installed, skip down to Hello World Tutorial. Also, there are a few other installation options listed here. Before I could install InSpec, I needed to have the latest version of Ruby installed. And before I could install the latest version of Ruby, I had to install Homebrew, the OS X package manager. So now do you have the latest version of Ruby 2.3.0?? It’ll say after you run that last command. UPDATE: It’s preferable to use the InSpec that comes with the ChefDK, but if you’re not using ChefDK otherwise, feel free to use the standalone version of InSpec. They do update it more often. Again, here are the other installation options. Just to be sure everything went according to plan, run inspec, and you should see something that looks like a command menu. So now we’re all updated, and we’re ready to get started. In that folder, create a file called hello.txt. Create a file in that same folder called hello_spec.rb. In that file we’re going to create a control with a file resource having a content matcher ‘Hello World!’ in it. In other words, this file is going to check and see if the other file has any text in it that matches ‘Hello World’. end                                                 # rest is just metadata, but it's a good habit to get into. Now go to that folder in your terminal, and let’s run the command. Okay, so you probably don’t like failure any more than I do, so let’s edit that text file so that we pass. Add the text “Hello World!” to the hello.txt file. Now let’s go back to our terminal and rerun inspec exec hello_spec.rb and see what happens. Doing this little exercise helped me to get my mind around what Chef Compliance does at a very basic level. I really like how clear and concise the framework is. In later posts, however, I’ll tell you where I’ve been tripped up and how I got around that. At its core, however, I think that it’s within my grasp; I just need to study up on some more basics.